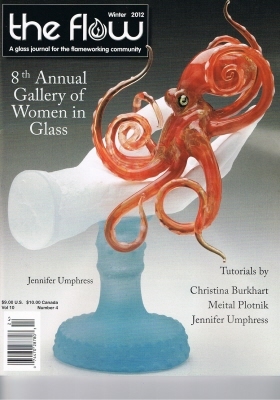 Winter 2012,8th Annual Gallery of Women in Glass. This is the newest release featuring "Women in Glass"
How to demos include a Sea Pod Beads.Froggy Friends,Preparing Reactive Cane plus loads more. Articles by Jennifer Umphress,Christina Burkhart and Meital plotnik.